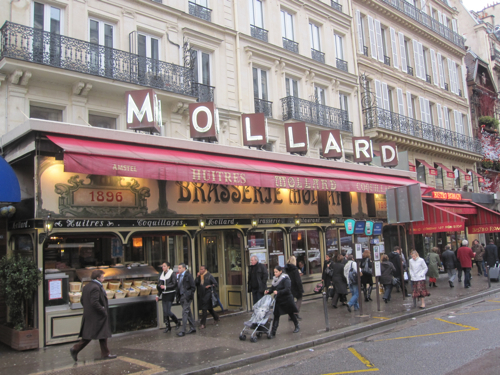 During winter, Mollard’s daily specials are displayed in abundance on the sidewalk outside this splendid brasserie close to Saint-Lazare train station. Oysters, seafood, shellfish are the specials here which sound so much nicer in original French: Huîtres, Fruits de Mer, Crustacés. You can’t go wrong with them at Mollard although it has to be said that this brasserie is yet another example of a restaurant that deserves three stars for its ambience and decor while the food is, well, only average. Still, a visit is highly recommended for all true Paris lovers. 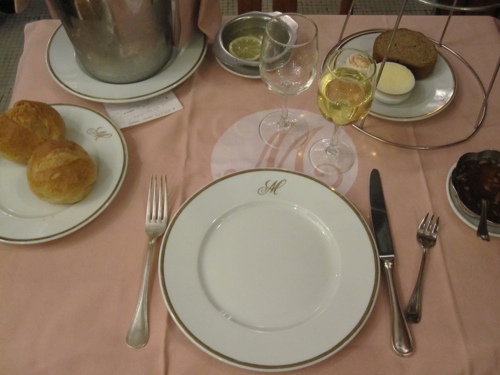 The Mollard brasserie was founded in 1880 by a couple from Savoy that commissioned the architect Edouard Niermanns to refurbish the pub in 1894. Niermanns was the avantgarde type, fortunately, so he called in fashionable Italian and French artists who launched a kind of radical redesign. Niermanns used multi-coloured marble to dress the walls, he followed contemporary designs, his craftspeople created marvellous mosaics all over the halls and hidden dividers of this huge établissement. 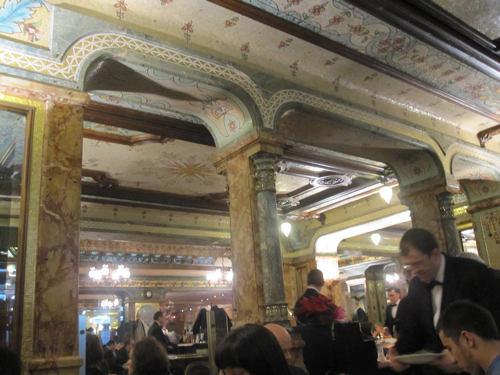 Situated close to the train station, the brasserie got representations of cities served by Gare Saint-Lazare, like Sant-Germain-en-Laye, Trouville or Ville-d’Avray as well as symbolic portrayals of autumn and winter and some ladies’ portraits that look like early clichés of the soon to be celebrated art nouveau. Today, Mollard is packed, especially around lunchtime, people queue to get a table and the lucky ones will be served by fast and professional waiters in black-and-white. Once seated, you can enjoy eating in a living museum, you’ll feel like riding a dinosaur that has survived extinction and successfully struggled through wartimes and depressions, plenty of economic crises and even the Nazi occupation. Mollard – 130 years old and still going. Let’s keep it alive. 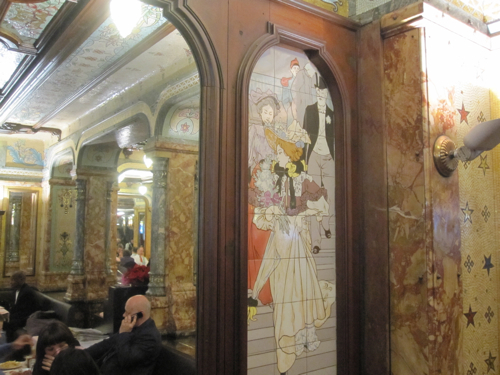 Open everyday from 12 noon to 0h30 a.m.
Niermanns' masterpiece of Art Nouveau called "Mollard"